This tent camp is located up the North Fork of the Sun River and is 16 miles into the Bob Marshall Wilderness (five hours on horseback). Cabin Creek sits at just over 5,000 feet in elevation and is a among a long river valley, rolling hills, lodge pole pines, aspens and burn areas. This terrain provides some of the finest elk and whitetail deer hunting in the state. Hunting in this camp is primarily done on foot and quite close to camp. Horses are always available and used during this hunt if you so desire. This camp is set up mid June and is used for summer fly-fishing as well as both archery and rifle season. Yet another tent camp located up the North Fork of the Sun River, in the Bob Marshall Wilderness; however, a bit longer travel to get there (20 miles/seven hours on horseback). Lynx Creek sits at nearly 5,500 feet elevation with an elevation gain of up to 1,500 feet while hunting. 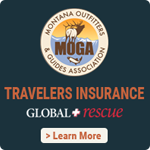 This camp allows access to both species of deer (whitetail and mule) while in pursuit of your elk. Hunting is done on foot and horseback out of this camp. 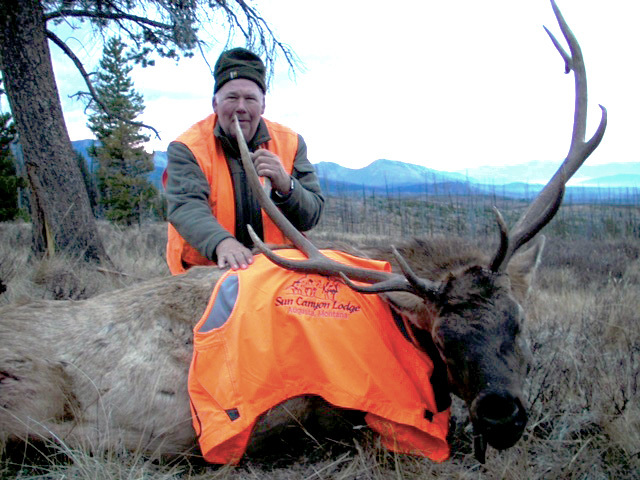 The majority of the elk hunting takes place within a few miles from camp. The Lynx Creek camp is set up the first of September and hosts both archery and rifle hunters. This tent camp is located ten miles into the Lewis and Clark National Forest (three hours on horseback). At 6,400 feet elevation, this camp proves to be a perfect setting to harvest your trophy mule deer with a slight chance of elk. You will ride your horse out of camp to the specific hunting areas daily. Prepare for lots of glassing and spot and stalk type hunting. This country is rugged, steep and provides great vistas. During general rifle season, we hunt the deer summer range to their wintering range on the Rocky Mountain Front. If you don’t feel up to a long horse ride and prefer a shower in the evenings, then stay in a small, rustic cabin and hunt out of our Lodge. All meals are taken in our main Lodge. Hunting is done on horse and four wheel drives for elk and both species of deer. Enjoy beautiful scenery and great hunting opportunity without the trek into the Wilderness. Our Lodge hunts are only during the general rifle season.